When youâre dealing with the most famous fighter of them all things have to be just right. The Wingleader Spitfire captures the âlinesâ of the early Spitfires to a tee!! This printed kit requires careful cutting out and reasonable skill to assemble accurately but the end result is more than worth it. Even the wing root fairings are simulated and that characteristic âellipticalâ wing just flows into the fuselage. The kit contains a superb scale canopy, undercarriage and rubber motor, so all you need to complete her is glue and covering dope. Even the tissue is in the box! With that accurate external shape she just cries out to be carefully painted in an authentic scheme. 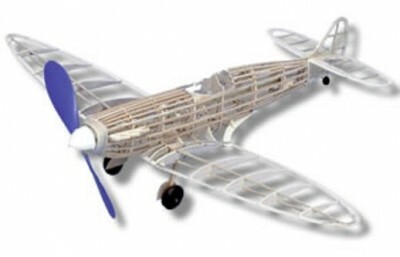 With Spitfires, thereâs hundreds to choose from and yours could be truly unique! Although only 470mmâs in span, the Wingleader Spitfire still gives you a great flight each time and youâll want to keep her constantly in the air!! Adhesives and paints etc are not included in the kit and will need to be purchased separately.